Ethnobotany in South-Eastern Europe is gaining the interest of several scholars and stakeholders, since it is increasingly considered a key point for the re-evaluation of local bio-cultural heritage. The region of Gollobordo, located in Eastern Albania and bordering the Republic of Macedonia, is of particular interest for conducting ethnobiological studies, since it remained relatively isolated for the larger part of the 20th Century and is traditionally inhabited by a majority of ethnic Macedonians and a minority of Albanians (nowadays both sharing the Muslim faith). An ethnobotanical survey focused on local food, medicinal, and veterinary plant uses was conducted with 58 participants using open and semi-structured interviews and via participant observation. We recorded and identified 115 taxa of vascular plants, which are locally used for food, medicinal, and veterinary purposes (representing 268 total plant reports). The Macedonian Traditional Ecological Knowledge (TEK) was greater than the Albanian TEK, especially in the herbal and ritual domains. This phenomenon may be linked to the long socio-cultural and linguistic isolation of this group during the time when the borders between Albania and the former Yugoslavia were completely closed. Moreover, the unusual current food utilisation of cooked potatoes leaves, still in use nowadays among Macedonians, could represent the side effect of an extreme adaptation that locals underwent over the past century when the introduction of the potato crop made new strategies available for establishing stable settlements around the highest pastures. 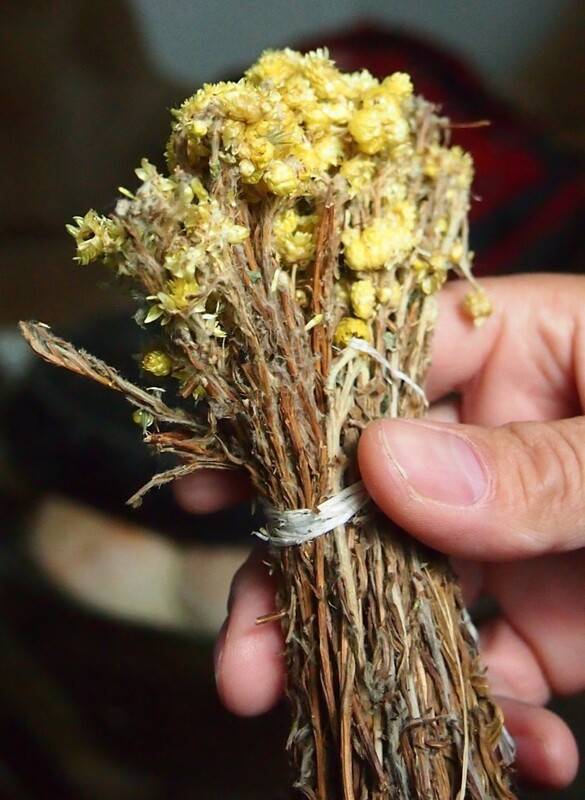 Additionally, the difference in use of Helichrysum plicatum, which is popular in the local Macedonian folk medicine but absent among Albanians, confirms the particular significance of this taxon as it relates to the yellow colour of its flowers in South Slavic folklore. Botanical studies with an ethnographic approach are crucial for understanding patterns of use of plants within given cultures. Importantly, such studies can also allow for analysis of the dynamics of change in these TEK patterns over the time. The results of this study may be important as baseline data set to be used in rural development programs in Gollobordo, aimed at fostering community-based strategies of management of natural resources. Ethnobiological studies conducted in recent years in Eastern Europe have highlighted complex, dynamic systems of folk botanical, mycological, and ecological knowledge [1–28]. This heritage is known in the ethnobiological literature as Traditional Ecological Knowledge (TEK), which has been defined as a "cumulative body of knowledge, practice and belief evolving by adaptive processes and handed down through generations by cultural transmission, about the relationship of living beings (including humans) with one another and with their environment” . In particular, the portion of TEK concerning plants is nowadays increasingly considered crucial in South and South-Eastern Europe for fostering community-based strategies of management of natural resources. It may also represent the starting point for initiatives aimed at the reevaluation of local plants devoted to both small scale food and herbal markets and eco-touristic initiatives [30–37]. Additionally, studies focused on plant uses that have been conducted in Eastern Europe with an in-depth historical or ethno-historical approach [38, 39] or via archival research and/or contemporary surveys conducted among botanists remembering their childhood [40–44] have demonstrated how plant perceptions change over time, in response to a complex interplay of socio-cultural, environmental, and economic dynamics. In the past few years, we have concentrated our research on the botanical knowledge overlaps and exchanges between South Slavs and Albanians in multi-cultural or bordering areas in South-Eastern Europe [26, 39] and on the resilience of TEK  among diasporas in the same area . In these studies, we observed phenomena of hybridization of botanical knowledge, as well as a more “herbophilic”  attitude of the Slavs in comparison to the Albanians. 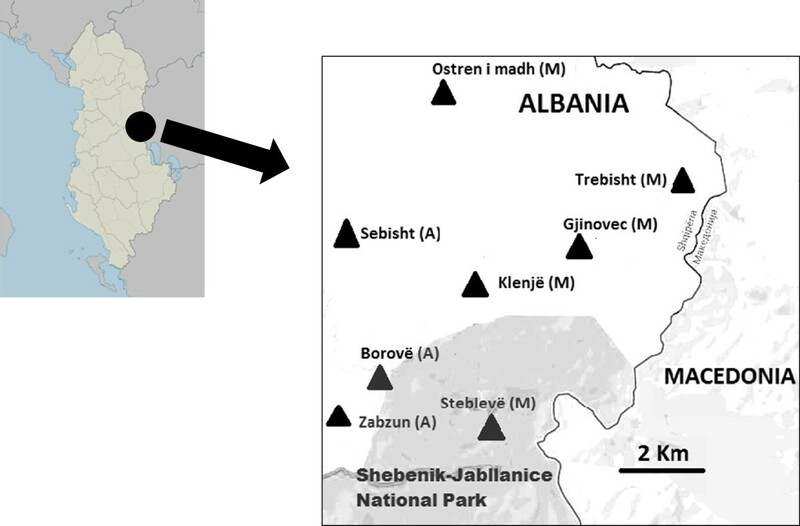 In the current study, we wanted to further analyze the local botanical knowledge systems among Macedonians and Albanians living in the Gollobordo region, in Eastern Albania. We could postulate that ethnic Macedonians in this area in Albania preserved much of their original folk botanical heritage because of their isolation in the past decades. This isolation was especially evident during the Communist period (1945–1991), both from the Albanian neighbors and also from those Macedonians, who remained after the creation of the Albanian state (1912) on the other side of the border (at the time within the territory of the Kingdom of Serbia, later Kingdom of Serbs, Croats and Slovenes and then Yugoslavia, nowadays Republic of Macedonia). Nevertheless, the fact that both the Albanian and Macedonian communities of Gollobordo share the same faith (Islam) for the most part, with some intermarriage in the past decades, there may have been some exchange of botanical knowledge. In order to assess all of this, we designed the objectives of this study to: 1) record traditional uses of local botanicals (both cultivated and wild) for food, medicine, and veterinary purposes among Macedonians and Albanians; 2) verify the occurrence of an expected richer, “more conservative” Macedonian ethnobotany; and 3) analyze differences and commonalities in the traditional plant knowledge between the two communities and to propose some explanatory models. The current study was conducted in eight villages of the mountain of the Gollobordo area, in Eastern Albania, bordering the Republic of Macedonia (Figure 1); the focus was on three villages inhabited by ethnic Macedonians: Klenje (1,203 m.a.s.l), Gjinovec (1,252 m.a.s.l. ), and Steblevë (1,200 m.a.s.l.) – this last village included within the newly established Shebenik–Jabllanice National Park, with an overall permanent population of approx. 300 inhabitants (while Gjinovec is only inhabited nowadays during the late spring and summer months); and three villages inhabited by Albanians: Sebisht (915 m.a.s.l. ), Borovë (940 m.a.s.l. ), and Zabzun (1,028 m.a.s.l. ), with an overall permanent population of approx. 300 inhabitants as well. Additionally, in order to have a sample more adherent to the ethnic proportion of Gollobordo (for which more than two-thirds is inhabited by Macedonians), a few additional interviews were also conducted in the larger Macedonian villages of Ostren i madh (948 m.a.s.l., approx. 1000 inhabitants) and Trebisht (782 m.a.s.l., approx. 1,000 inhabitants). The local economy is based on small-scale farming and pastoralist activities, with a significant portion of the population that migrates to Tirana and/or other city centers and sometimes back for a few months in their villages only during the late spring and summer months (Figure 2). According to the Albanian Institute of Statistics data, Gollobordo and the entire Eastern and North-Eastern region of Albania (covering Peshkopia and Kukës counties) are among the economically poorest areas of not only the country, but also all of Europe . All of the villages in the Gollobordo are nowadays permanently inhabited only by families of Islamic faith, while until the 1990s, most of the Macedonian villages also had an important Christian Orthodox component. 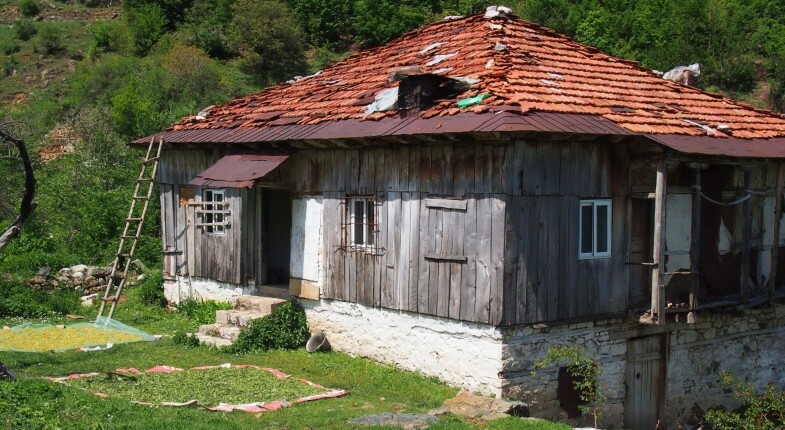 The local dialect of the Macedonian minority, now spoken by less than 3,000 inhabitants, has been the focus of a number of studies conducted by Slavic linguists in the past Century. Two remarkable field ethnolinguistic and ethnographic studies have also been conducted in Gollobordo in recent years [49, 50]. Typical Macedonian house inhabited nowadays only in the late spring and summer season in Gjinovec (1,252 m.a.s.l.). The climate of this area is continental, with very harsh temperatures and snowfall during the winter season. The landscape around these villages is dominated by low mountains covered by the Quercus frainetto woodland belt, and by the Fagus sylvatica woodland belt at higher elevations. Sometimes it is possible to find some woodland fragments of Quercus cerris (in soil containing more clay) and Castanea sativa (in more acidic soil); in addition, there is some reforestation by Pinus nigra, probably carried out during the Communist period (1945–1991). The landscape is also covered by large extensions of secondary patches of semi-natural dry and humid grassland. A riparian marshy vegetation is found along the valleys, which is frequently fragmented and residual, dominated by some species of Salix, such as S. alba, S. eleagnos (sometimes really large) and, less frequently, S. purpurea. In the secondary succession, it is easy to find some different shrub species such as Corylus avellana, Cornus mas, Juniperus communis, Crataegus monogyna, Crataegus sericea and Juniperus oxycedrus. Up to the village of Klenje, within a high plateau, we could observe a large population of Prunus cocomilia. The main herbal vegetation in the villages is anthropogenic, with ruderal/nitrophylic species and cultivars like Vitis labrusca, some fruit trees (esp. Prunus species) and some vegetables; Vitis labrusca is traditionally cultivated climbing on trees with light pruning. The main trees are situated in a gradient between wild and domesticated conditions: Fraxinus excelsior, Quercus cerris, Q. frainetto (mostly as totem trees), Prunus avium, P. domestica, P. cerasus, P. cerasifera, Juglans nigra, Cydonia oblonga, Malus domestica, Pyrus communis, Robinia pseudoacacia, Populus nigra, Ailanthus altissima, Syringa vulgaris, Acer campestre, while the most common shrubs are Rosa canina s.l. and Rubus hirtus, R. caesius, R. ulmifolius, and Clematis vitalba. In May 2013, in-depth open and semi-structured interviews were conducted with community members (n = 58, 43 Macedonians and 15 Albanians; age between 9 and 87 years old), which were selected using snowball sampling techniques. Study participants were asked about traditional uses of food, medicinal, veterinary, and ritual plants (in use until a few decades ago or still in use nowadays) via semi-structured and open interviews, walks in the natural environment in the proximity of the villages together with informants, and participant observation within the households. Specifically, local name(s) of each quoted taxon, the plant part(s) used, in-depth details about its/their manipulation/preparation and actual medicinal or food use(s) were recorded. Interviews were conducted in Albanian or Macedonian languages with the help a bilingual simultaneous translator. Prior informed consent was always verbally obtained prior to conducting interviews and researchers adhered to the ethical guidelines of the American Anthropological Association . During the interviews, informants were always asked to show the quoted plants. Voucher specimens were taken for the wild taxa, when available, and are deposited at the herbarium of the School of Biosciences and Veterinary Medicine of the University of Camerino, Italy (Herbarium Universitatis Camerinensis; acronym: CAME). Taxonomic identification was conducted according to the official Flora of Albania [52–55] and the previous Albanian Excursion Flora . For Crataegus spp. we referred to the Rosaceae’s taxonomy in Euro + Med PlantBase . Family assignations follow the Angiosperm Phylogeny Group III system . Local plant names were transcribed following the rules of the standard Ghegh Albanian and Macedonian languages. Overall, we recorded the local uses of 116 taxa of vascular plants; we documented 268 plant reports, 105 for food, 87 for human medicine, and 76 for veterinary applications. Given the variety of means through which data were elicited in the field, detailed cultural importance, frequency and consensus indexes, which do always require consistently performed interviews, were not considered in the data analysis. However, in the tables and in the data used for the comparison we included only plant uses reported by at least two informants, as well as those uses, which were quoted by the majority of the interviewees. The food use of 55 taxa were recorded, 25 of which are wild or semi-domesticated (Table 1). Prunus cerasus var. marasca (Host) Vis. Ribes multiflorum Kit. ex Roem. et Schult. Rubus hirtus Waldst. et Kit. §: first record of the species in Albania. In bold: folk taxa quoted by more than 40% of the informants. C: cultivated; SD: semi-domesticated; W: wild. Plant part(s) used: AP aerial parts; Bu bulbs; Fr fruits; Frfl flour from fruits; K kernels; L leaves; R roots; Se seeds; St stems; T tubers; UF unripe fruits; Wo wood; WA ashes from wood; YL young leaves. Among the most uncommon uses, we have to mention the use of potato leaves, both for sarma (leaves rolled around a minced meat and rice filling) and especially as filling for white corn-flour based pies (laknur or byrek in Albanian, komat in Macedonian), which is still very common among the Macedonians living in the highest villages of Gollobordo, while among Albanians this was remembered as a past use only. We found this use of potato leaves as filling for savory pies to be quite common in Gollobordo in June, after the “nettle season” (Urtica dioica), which is the primary wild plant used in the early spring, while Rumex spp. dominates later in the season as a pie filling ingredient. We recently found a similar relictual use among the last Albanians living in the upper Reka valley, on the Macedonian side of Mount Korab . The archaeologist Michael Galaty and his team have recently conducted intensive field research in the mountainous Shala Valley in Northern Albania. Galaty has proposed that the Little Ice Age and the introduction of maize, which took place in the Balkans starting from the 16th Century [59, 60], played a crucial role in the remarkable demographic expansion in this area in the 17th and 18th Century . We believe that the introduction of the potato crop (Solanum tuberosum) in the mountainous areas of the Western Balkans and in the Gollobordo area (presumably at the end of the 19th Century) may have also similarly determined a remarkable vertical expansion of the inhabited landscape, offering locals for the first time in the history of the region the possibility to permanently colonize and settle the higher pastures. As a side-effect of this shift, which was sustained by an increase of food resources (dairy products and potatoes), the leaves of the potato plant may have also been considered as a vegetable, especially in the spring, where this would have largely become available and when not many other green leafy vegetables are available (apart from wild nettles and Rumex spp.). The toxic glycoalkaloid content of the potato leaves could perhaps be reduced by the way in which they are traditionally collected and prepared. Only the young leaves are gathered and they are boiled in water before being used as a pie filling. Indeed, research on the chemistry of S. tuberosum leaves has demonstrated that glycoalkaloid content (measured by levels of α-solanine and α-chaconine) are at their lowest in the young leaves, with those appearing on the most distal-location of the stem having the overall lowest glycoalkaloid content . However, the boiling step likely reduces small level of the overall glycoalkaloid content, thus the final product would be expected to contain a somewhat bitter quality, and indeed, our participants confirmed that the pie made with potato leaves is appreciated exactly because of its “bitter taste”. On the other hand, the consumption of “bitter” potatoes (with high glycoalkaloid contents) has been well discussed by Timothy Johns  for the case of the Aymara population in Southern America, where bitter potato varieties (jank’o and luq’i) were often eaten unprocessed after the harvest. Other important uncommon cultivated food sources we found included the young leaves of corn (Zea mays) as pie filling, and bean leaves for use in sarma. Upon consideration of trees, the rare food use of Prunus cocomilia for producing home-made raki should be better analyzed under the viewpoint of sensory analysis for possible local economic development outcomes. In fact, the local know-how on mixing, fermenting, and home-distilling various Prunus tree fruits in Gollobordo, as in other areas of the Balkans, seems to be extremely sophisticated. The recorded local uses of 53 medicinal plant taxa are reported in Table 2. It is worthwhile to mention the case of Helichrysum plicatum (Figure 3), which is the most quoted taxon among the Macedonians of Gollobordo. Within this ethnic group, this medicinal herb is the most frequently used remedy as it is applied in the treatment of many diseases as a kind of panacea. The high cultural consensus concerning the use of Helichrysum spp. in the Macedonian and Bulgarian medical folklore is remarkable in the scientific literature. A number of folk names referred to this taxon in Bulgarian retain the root “smil”, which has the meaning of physical beauty and health; moreover, in Bulgarian folk medicine, this taxon has been considered to be a real panacea and is often used for many purposes: as a diuretic, against dropsy, liver diseases, jaundice, stagnation of blood in the abdomen, tinnitus, low blood pressure, bone spikes, rheumatism, sciatica, rickets, worms, deafness and for treating skin diseases [64, 65]. The ritual use of this plant in the South Slavic folklore is often linked to the bright yellow color of its flowers, which symbolizes sun and light, virginity, moral purity, and mercy in the Balkan folkloric tradition . In Bulgaria, Helichrysum had to be collected in the morning of Georgyovden (corresponding to St. George’s day, May 6th) and were sewn into the hem of garments as an amulet. In order to prevent jaundice in newborns, a bunch of Helichrysum was placed under the infant’s pillow. The flowering aerial parts of this plant were used in wedding bouquets and the plant is mentioned in wedding songs and used as a sign of marriage [65, 67]. Additionally, flowers of Helichrysum were believed to be able to provide a girl with a fiancé; according to this belief, while the flower is fresh, the girl will be a maiden, when it has withered – she will be engaged, and when it is dried – she will marry . Helleborus odorus Waldst. et Kit. ex Willd. Sideritis raeseri Boiss. et Heldr. Ulmus minor Mill. and other Ulmus spp. Plant part(s) used: AP aerial parts; Bu bulbs; DFB dried fruiting body; DW decayed wood; FAP flowering aerial parts; FB flowering branches; Fl flowers; Fr fruits; FT flowering tops; G galls; J juice; L leaves; R roots; Se seeds; Sh Shoots; T tubers; Th thorns; UF unripe fruits; WA ashes from wood; WC charcoal from wood; YL young leaves. Dried flowering aerial parts of Helichrysum sp. The uses of 57 plant taxa for ethnoveterinary purposes are reported in Table 3. Apart from a certain number of fodder plants and a few medicinal remedies, a large portion of this section of the local ethnobotany is represented by plants that are used ritually for the Georgyovden feast (corresponding to St. George’s Day), in order to propitiate good health for the animals or a successful season for the dairy products. This tradition is especially relevant within the Macedonian community and it is well rooted within other South Slavic customs. In Bulgaria, for example, the St. George’s Day is associated with plant decorations being used to “protect” the animals and the house: Salix spp., Juglans regia, Artemisia spp., Clematis vitalba, Glechoma hederacea, Veronica officinalis, Chamaecytisus hirsutus, Convallaria majalis, Ranunculus acris, Caltha palustris, Ajuga spp., Lamium purpureum, and Ranunculus ficaria[65, 67, 68]. Helichrysum plicatum DC. and other Helichrysum spp. Tanacetum macrophyllum (Waldst. et Kit.) Sch. Bip. Trifolium incarnatum L. ssp. molineri (Hornem.) Ces. CAME 26318, and other Trifolium spp. Plant part(s) used: AP aerial parts; Br branches; Bu bulbs; BAFP Branches with flowering aerial parts; FAP flowering aerial parts; FB flowering branches; Fl flowers; Fr fruits; L leaves; R roots; Sa sap; Se seeds; St stems; T tubers; Wo wood; WA ashes from wood; WP whole plant. Drazheva has analyzed the coincidence of St. Georges’ Day with the most important spring feast in rural Bulgaria, which is widespread with varied rituals . According to this review, one of the main circles connected with St. George's Day focuses around the ritual taking of the sheep to their summer pasture, the ritual milking, the sacrificial practices devoted to a saint who has inherited the characteristic features of the patron-ancestor of the Thracian Heroes, including the open-air feast usually associated with them. A second circle of rites and customs connected to Georgyovden is intended for guaranteeing health and well-being for the family, with fortune-telling about the forthcoming wedding feasts for the young people, which is directly related with the reproduction of the community in both its biological and social dimensions. 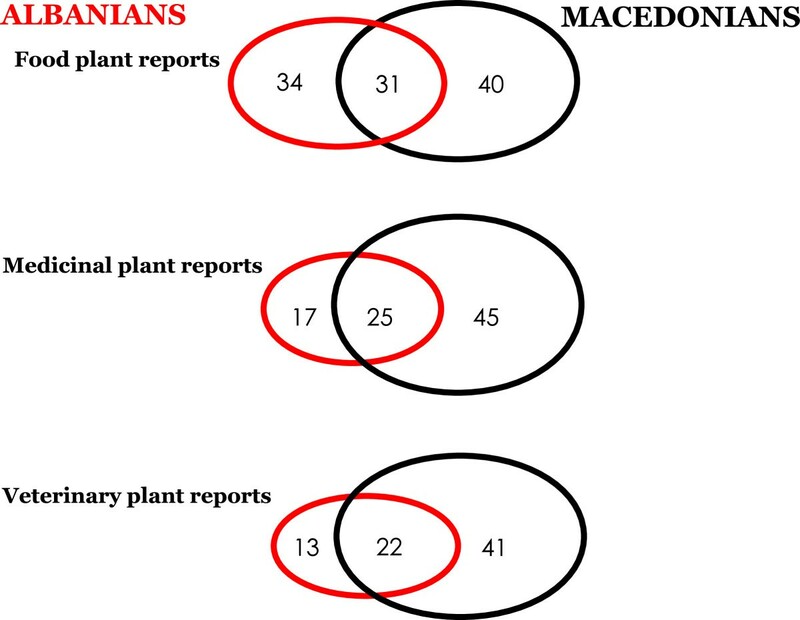 From our analysis of the overlap between the Macedonian and Albanian ethnobotanies, we could point out that majority of plant reports (approx. half) were quoted by Macedonians only. However, this could be due to the uneven sample selection between the two field studies: the number of the Macedonian informants was roughly three times larger than the number of the Albanian interviewees. On the other hand, it is important to note that only extremely limited new information was found in both communities after the first dozen in-depth interviews. Our findings could support the persistence of a more “herbophilic” attitude among South-Slavs, as we have already postulated in previous cross-cultural comparative studies in the Western Balkans [26, 46]. Moreover, since Macedonians were and also are those in the study area who trade/sell the largest share of wild crafted medicinal herbs to the nearby Albanian towns (i.e. Elbasan, Tirana) and markets or via Albanian middle men, their knowledge of these plants remains within their sphere of household economics. Thus, these activities may have delayed the decrease of local plant knowledge among this population. The plant reports found in common between the two communities are approx. one third of the overall recorded plant reports (Jaccard Index: 0.29). This would demonstrate some diverging trajectories of the ethnobotanies of the two groups, despite many years of living together in the same area and sharing the same religious faith. Nevertheless, these commonalities demonstrate how cultural edges are particularly significant in bio-cultural diversity . The overlaps of the folk plant reports in the three considered domains (food, human medicine, and veterinary) are represented in Figure 4. In all three domains, the Jaccard Index measuring the similarity of the data sets collected among Albanians and Macedonians in Gollobordo is 0.29, although internal uses of medicinal plants (teas) and also ritual uses of veterinary plants made at Georgyovden seem to be much more relevant among Macedonians. Diagram representing the overlaps between the food, medicinal, and veterinary plant reports recorded among Macedonians and Albanians in the study area. We recently applied the concept of resilience to migrants’ ethnobotanies , while defining resilience as the capability of socio-ecological systems to absorb disturbances and to retain their basic structures and functions, which includes in particular four pillars : 1) the capability of the systems of learning to live with change and absorb it; 2) of nurturing diversity for reorganisation and renewal; 3) of combining different kinds of knowledge for learning; and 4) of creating opportunities for self-organisation. The remarkable resilience evident in the Macedonian medical and veterinary ethnobotanies is indicative of a complex cultural adaptation processes that this community underwent. Moreover, the isolation of this community may related to the difficulties that Macedonians have experienced in accessing the mainstream Albanian culture and institutionalized health as well; the proof of this isolation can be seen in the generation of elderly women, who are the health care givers within the households and often still show difficulties in fluently speaking the Albanian language. Isolation could be ultimately seen then also as a kind of adaptive mechanism. This also shows how negotiations among diverse ethnic groups in mountainous areas could be linked to the practice of symbiotic relations and pluralism, as in the case studies of the Wakhi and Kyrgyz and Pashtu and Shugni of the Pamir [72, 73]. In 1956, Fredrik Barth proposed for his field site in the mountains of Swat, North Pakistan, a path-breaking reflection for those times concerning the link between the use of certain ecological niches and ethnic boundaries . According to his observations, the distribution of ethnic groups ecological niches is controlled by the distribution of species each group is able to exploit. Moreover, different ethnic groups may exploit the same ecological niche only if the weaker of them would be better in using marginal environments. The history of Gollobordo’s Macedonians in the last century seems to confirm this, since this group remained concentrated in the highest and more inhospitable village sites, while Albanians began to replace Macedonians in the villages located to lowest altitudes. The Macedonian group had to learn to make use of these marginal areas and the affiliated local resources, including the use of potato leaves for food and the reliance on several herbal medicines, in both the domestic arena and for trade. Although partly symbiotic, the relationship between the two communities has not been equal and the Macedonians have occupied the more marginalized socio-cultural niche. Local environmental resources derived from plants continue to play an important role in the provision of dietary and medical care for both humans and their livestock in Gollobordo’s communities. We could confirm a more herbophilic attitude of the Macedonians, especially with regards to medicinal and veterinary plants, while the overlaps between the Albanian and the Macedonian ethnobotanies are still relatively limited (restricted to a quarter of the overall recorded plant reports). This confirms that in Gollobordo, despite the two communities having shared the same religion and the same environmental space for many decades, the “original” TEK systems still persist, perhaps due to the geographical and cultural isolation of the area, especially with regards to the Macedonian community. Initiatives aimed at generating an endogenous rural development and especially at fostering sustainable gathering activities of local plants – as well as their small-scale trade and eco-tourism – should seriously consider these cultural divergences. This could in turn promote a tighter collaboration between the two communities and help to sustain the threatened linguistic and cultural heritage of the Macedonian minority. Special thanks are due to all informants, who generously shared their knowledge regarding local plants and especially to Hajredin Ferataj, Prishtinë, Republic of Kosovo, for the simultaneous translations; to Tanya Gervasi, Giaveno/Milan/New York and to Domenico Lucarini, Herbarium of the University of Camerino (CAME) for the assistance. The fieldwork has been conducted with the financial support of the University of Gastronomic Sciences. AP and KV conducted the field study and identified the plant samples. AP, AN, and CLQ analyzed the collected data; AH and BM contributed to the comparison with the Albanian ethnobotanical data; AN conducted the comparison with the Bulgarian ethnobotany and folklore; AP and CLQ wrote the manuscript and drafted the discussion. All authors read and approved the final manuscript.